Kevin and I have been married for almost 13 years and we have 5 children. Our two oldest are from Kevin’s 1st marriage. Ashley, is our oldest at 25, she is married with 2 children of her own. Stephanie is a 22 year old graduate student at Boston College. Our remaining children are Luke, our 9 year old, Claire who is 8, and Catherine is 7. Luke and Claire were born in China and joined our family in 2004 and 2011 respectively. I am an attorney and Kevin is retired law enforcement. We had tried to have children without success. I required open heart surgery and during the time I was recovering from that we decided that the best way to bring a child into our family was to adopt. Luke’s adoption was completed in May 2004. In August 2010 Luke told us he thought we should “Go to China and get another kid.” That started a dialogue within our family about adopting again. Then we heard about Claire and knew she was meant for our family. Adoption can be an intrusive process; complete strangers dig into every aspect of your life and have the final say about whether you are “fit” to be a parent. But when a child joins your family, it doesn’t matter how that occurred, it only matters that it happened. Adoption is a lesson in patience and perseverance but at the end of the day, like the pain of childbirth, once that child is in your arms and part of your family the difficulty of the process is easily forgotten. My experience of working with Mark Iverson and his office was a positive one. I know lots of adoptive parents who choose to do this last step on their own, and being an attorney I certainly could have done that. However, we felt that this is just too important and wanted to make sure that it’s done right. I’ve known Mark for a long time and have had the immense pleasure of working with him in a professional capacity. So when we wanted to affirm our adoptions under Washington law, Mark was the clear choice. 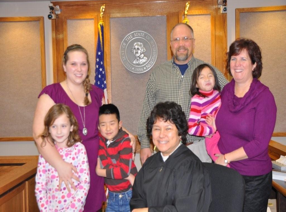 Mark has a tremendous amount of experience in adoption law. He handles matters in a professional and compassionate manner. He understands the process from start to finish and is so genuinely happy for the families he represents. Having Mark handle the US law part of our adoption has given us complete confidence that it was done right and so we don’t have to worry about some problem popping up down the road. That kind of peace is invaluable.